Standing outside in the courtyard of Dublin Castle at 12:55am on the 16th of January, the thought that crossed my mind was, what the hell am I doing here?? My training for the Art O’Neill started and ended with a recce of the mountain section of the course over Christmas which was a real eye opener to me, we ran 10k that day to get to the start of the “mountain stage” and at that point I was really feeling it, so I was thinking, what will I be like after running 30k. 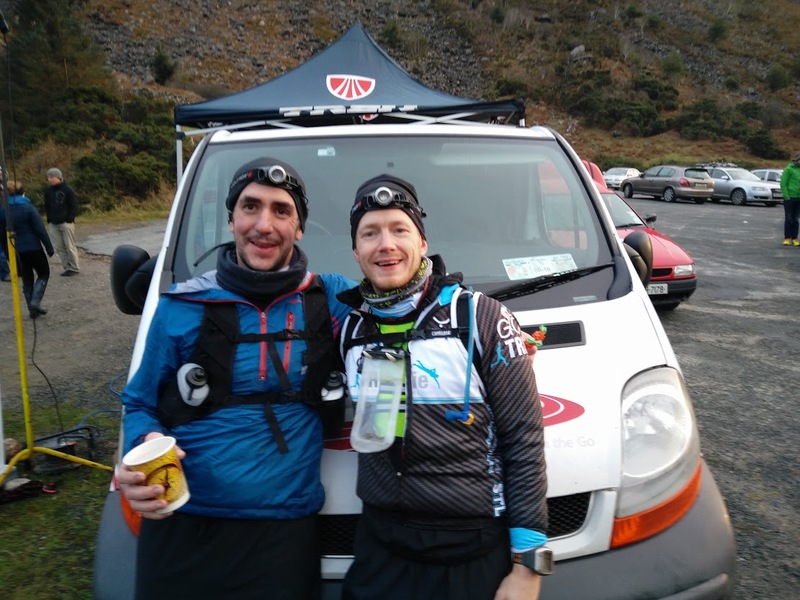 Stephen Teeling-Lynch and I traveled up to Wicklow with Loren Hartnett and Brendan Cross, as veteran adventure racers at this stage, I was plaguing them with questions the whole way up. The bus from Wicklow to Dublin was good craic, my stomach wasn’t the best but Martin acted as the sacrificial lamb for all the slagging, as usual which lightened my mood a bit. 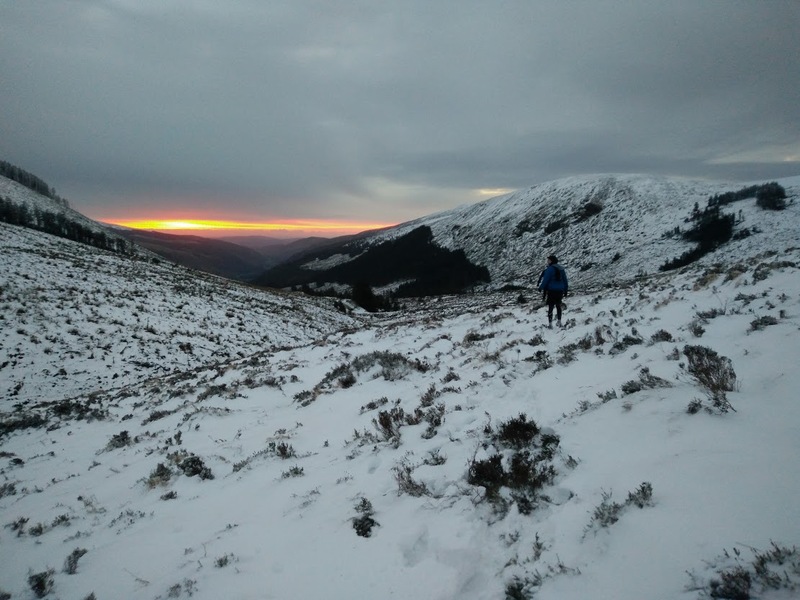 My main anxiety coming into the race was about not wanting to do the mountain section on my own, I hadn’t used the GPS app on my phone before so I had visions of getting lost out on the Wicklow mountains on my own. Then there was the worry about my phone battery lasting, head torch battery lasting (even though I’d brought a battery pack for both), so as is usual for me, I was very nervous about what I was getting myself into. All the questions that I had asked the lads on the way up were I asked again while waiting at Dublin Castle, how many layers to wear, would you put an extra layer on up at checkpoint 1, I had an idea from having done the recce but that was during the day so it’s just another thing that you end up worrying about. We’d a rough plan that Martin Carey, Stephen Teeling-Lynch and I would stick together for the race if possible, Stephen and I didn’t have any experience with navigating across a mountain, at night, so I think we were both nervous about it. The run started and it was a strange experience running through the streets of Dublin at 1 in the morning. The first 10k was fine, we were running at a good pace and I stuck with Paul Tierney, Stephen and Martin were running on ahead I said I’d stick with Paul’s pace setting. The run started to go uphill at about 15k and people started to thin out a bit, with Paul Tierney, Derek Kiely, Stephen Geraghty and I running together. With a couple of kilometers to CP1 I was really feeling it in the legs and dropped back a little bit. When I arrived in CP1 the lads were already on the way out – thanks to Pauls instructions “Single Minute Transitions”! 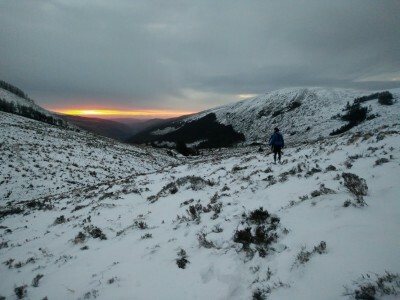 At this point I had images of having to do the next 4 to 5 hours on my own or being found frozen solid up the mountain somewhere so I literally threw on my trail runners grabbed the rest of the gear in my hands and legged it out of transition to try and catch up with the lads. I eventually caught up with them, but I was knackered and had to try and put on my gear while running, once we got to the mountain stage proper, the pace slowed and I managed to get everything on. That first uphill section of the mountain was the hardest part for me, Derek and Paul set a savage pace and we let them go, Martin was also flying it and would pull ahead and have to wait up for myself and STL, I was drifting back a bit and eventually Martin got a good bit ahead and I pulled out the GPS for the first time. Thankfully for me STL was tiring a bit and I managed to keep up with him and I kept a close eye on my phone and stuck to the route as much as we could. We could see head torches taking a route to the left but I was sure we were on the right line so STL and I stuck to the right-hand side. It may have only have been 5 or 6k at this point to the CP2 but it might as well have been 20k as we were going so slow at this point, we were both exhausted and I had to try and force some food into me even though it was the last thing that you wanted to do. I managed to eat some solid food and slowly I started to feel a bit better and we were able to run (shuffle) across the mountain, we spotted flags on the route and they followed our line so we knew we were on the right course. After what seems like an eternity we got to a fire road, it was fairly icy and once we stepped onto it, we both nearly went flying but a combination of a pirouette and a hug between myself and STL kept us both on our feet. We continued our way down the road and two guys came past us, and it turned out to be Stephen Geraghty and Martin Carey, so we stuck together to check point 2. There was no thoughts of a “Single Minute Transition” at this point, my body was exhausted, but I felt confident of being able to finish and I had a bit of confidence that if I did end up on my own I’d be able to navigate my way through to the end. We grabbed some porridge which felt like a 3 Michelin star meal at that point, had a banana and took a quick-ish rest. At this point STL wasn’t feeling the best so he told us to go on ahead so Stevie G, Martin and I made our way reluctantly out of the tent and back out into the cold. I told the lads that if they wanted to push on to work away and to not hang around, but it seemed like we were all in the same boat so we pushed on together up towards Arts cross, the route that we were following took a steep section up to the peak, which we hadn’t done of the recce so I wasn’t sure if it was going to be as tough a the lads had said it was, it turns out they weren’t exaggerating! We’d met a fellow competitor who wasn’t sure of the route at the base of the steep section, so he fell in with us and the four of us pushed up to the top. One of the hardest things about this was that it was pitch dark and you had no idea how far you had to go until you got to the top. My relief of reaching there was short-lived as there was a lot of snow on the mountain so walking through the deep snow was torturous, I was at the back of the line and was struggling to keep up, but just concentrated on trying to walk in the footsteps in the snow in front of me. The guy we’d met had pushed on and we were passed by another couple of people, but at this point I think the three of us were all just concentrating on getting to the finish line and not worrying too much about positions. So we kept plugging our way down the mountain, any thoughts of trying to pick up the pace was gone, but the we knew we weren’t too far from the end and the spirits weren’t too bad in the group. At this point the sun was beginning to rise and the views were absolutely breath-taking, and I felt that this made the whole adventure worthwhile. We eventually got onto the fire road and made our way through a couple of very icy sections to get onto the home straight. We tried to push it a bit for the last kilometer or so but our bodies weren’t having any of it so the three of us hobbled over the line together (a second occurrence for Stephen Geraghty and I at and adventure race). Crossing the line I was filled with relief that I had managed to complete the race. It was probably the hardest thing I’ve ever put myself through, I have nothing but admiration for the GoTri Adventure group who compete at these races on a regular basis, I’m not sure if I’m up to putting myself through this as often as they do, but I’ll be back next year!